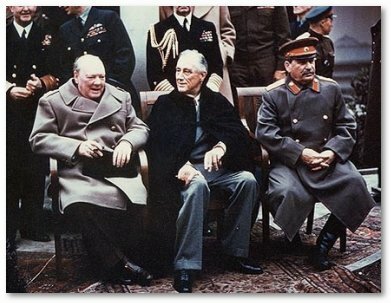 FROM THE 4TH TO THE 11TH FEBRUARY 1945, a three-power conference was held in the Soviet health resort of Yalta. It was attended by Churchill, Roosevelt and Stalin with their foreign ministers, Eden, Stettinius and Molotov respectively, and representatives of the three general staffs. The main tasks facing the three great powers of the anti-fascist coalition were to complete the defeat of the common enemy and establish the foundations of a lasting peace. In pursuance of the latter, it was necessary to reach agreement on the control of Germany after her capitulation, on a policy towards the liberated countries of Europe, and on the establishment of a peace-keeping organisation. At the conclusion of the conference, the three great powers agreed to issue the following statement: "It is our inflexible purpose to destroy German militarism and nazism, and to ensure that Germany will never again be able to disturb the peace of the world. We are determined to disarm and disband all German armed forces; break up for all time the German General Staff that has repeatedly contrived the resurgence of German militarism; re- move or destroy all German mili'tary equipment; eliminate or control all German industry that could be used for military production; bring all war criminals to justice and swift punishment, and exact reparation in kind for the destruction wrought by Germans; wipe out the nazi party, nazi laws, organisations and institutions; remove all nazi and militarist influences from public offices and from the cultural and economic life of the German peopLe; and take in harmony such other measures in Germany as may be necessary to the future peace and safety of the world." The whole document of the Crimea Conference, of which the above is a part, was supported in the House of Commons on the 1st March 1945 by 413 votes to nil. The Viscount Hinchingbrooke, MP: "The decisions reached at Yalta transcend those of any other international conference ever heard." Hamilton Kerr, MP: "The Yalta agreement offers the surest hope to an exhausted and distracted world. If the British Commonwealth, the United states and the Soviet Union continue to work together in the spirit of the Crimea Conference, then settled conditions will return, not only to Europe, but likewise to the Middle East and to the Far East; for the agreement sends a message of reassurance to the furthest part of the globe. " The Bishop of Monmouth: "Anti-Russian propaganda should cease once and for all in Allied countries. It is largely based on prejudice and ignorance and it is altogether pernicious. Let us substitute truth and trust for half-truths and hatred ...The Crimea Conference is a bright light in a dark world. Let us follow the light and it will guide the nations into the ways of peace." The Viscount Castlereagh, MP: "The greatest barrier to international co-operation and the in-direct cause of this war was the cold-shouldering of Russia after the last one ...The House of Commons by its recent vote not only endorsed the decisions of Yalta, it recorded a vote of confidence in Marshal Stalin's good faith. So long as the unity of the Big Three is maintained, so long is the barometer of democracy set fair." Dr. Haden Guest, MP: "The decisions agreed at the Crimea Conference mark the beginning of a new stage of world political development. The decisions are founded on the imperative necessity to achieve the defeat of German militarism and nazism." Lt.Col. Sir George Schuster, KCSI, MP: "The outstanding reality which overshadows everything else is that there is no chance for peaceful progress in the next chapter of human history unless Russia, the United States and the British Commonwealth can work together."